Strangely nobody here posted it, but the official Jurassic World channel is uploading new videos, some are new like the making of sounds. Other is Horner speaking about the new dinosaurs and new concept art! And one about props and easter eggs. Also some videos were blocked about the puppets of Indominus, Pteranodon and Ankylosaurus sounds! I have no idea why the videos for the puppet designs of the Indominus, Pteranodon and Ankylosaurus are blocked - fans would still eat those videos up! Some of these features I haven't even seen before on my Region 2 Jurassic World blu-ray. Which makes me wonder where one can find them, because the more features the better! - "Jurassic Park/The Lost World Jurassic Park, Director"
- "Jurassic World, Executive Producer"
Normally I'm not above a little bit of shade throwing towards Jurassic Park ///, but not mentioning it at all in his credits? 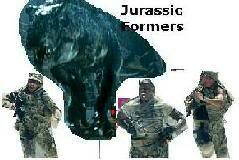 It gives me the impression that there is some intentional disassociation with JP3 from Spielberg and company. I know it's the least favourite among most fans of the franchise but the impression I get is that of the two "contested" sequels The Lost World will take precedence over JP3. They are most likely not, as when you click on them it says that the uplaoder has not made these videos available instead of getting the message that this video aint available on your country. Yep,mostly they are fixing it or soemthing. Plenty of new bts videos of Jurassic World!